Be the first to share your favorite memory, photo or story of Caroline 'Toots'. This memorial page is dedicated for family, friends and future generations to celebrate the life of their loved one. 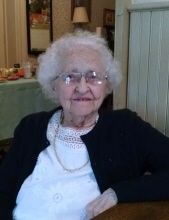 Caroline Luella Devilbiss, age 98, of Uniontown died Tuesday, December 4, 2018 surrounded by her family, in the home where she was born, raised and remained, always an integral part of her community. Affectionately known as “Toots”, she was born on May 20, 1920, a daughter of the late Thomas Leonard and Hilda Eckard Devilbiss. She was a 1938 graduate of New Windsor High School and following graduation remained at home to continue the 3rd generation with Devilbiss Grocery, as well as the Uniontown post office. She was the postmistress until 1998 and the following year the grocery store also closed. Toots was a member of the former St. Paul’s Lutheran Church, Uniontown and a current member of Mount Union Lutheran Church. She enjoyed gardening, going on bus trips with her sister, and reminiscing about historic Uniontown. Most of all she loved being home and caring for her family. Surviving are her sister, Janet Justice; sister-in-law, Kay Devilbiss; nieces and nephews, Karen Amoss, Thomas Devilbiss and wife Kathy, Terri Hoover and husband Bruce, Mark Justice and wife Laura, Donna Reese and husband Jack, Debra Brauning and husband Dale, Robert Devilbiss and wife Endora, Sandra Lepley and husband Dennis, and Linda Justice; and numerous great-nieces and great-nephews. She was predeceased by three brothers, Richard S. Devilbiss, Robert F. Devilbiss and wife Elizabeth, and Charles T. Devilbiss. The family will receive friends at her home, 3444 Uniontown Road, on Saturday, December 8 and Sunday, December 9 from 11 a.m. to 2 p.m. and 4 to 8 p.m.
A funeral service will be held at Mount Union Lutheran Church, 5000 Middleburg Road, on Monday, December 10 at 11 a.m. Rev. Cary Moorman, her pastor, will officiate. Interment will follow in St. Paul’s Lutheran Cemetery, Uniontown. In lieu of flowers, memorial contributions may be made to Mt. Union Lutheran Church, P.O. Box 411, Taneytown, MD 21787 or Carroll Hospice, 292 Stoner Ave., Westminster, MD 21157. To send flowers or a remembrance gift to the family of Caroline 'Toots' L. Devilbiss, please visit our Tribute Store. "Email Address" would like to share the life celebration of Caroline 'Toots' L. Devilbiss. Click on the "link" to go to share a favorite memory or leave a condolence message for the family.